It's time for the Blogger's Quilt Festival! This event, put on by Amy's Creative Side, happens twice a year around the quilt industry's Market show times. It is an online quilt show that's all about fun, sharing stories, and inspiration! So I just had to participate! First Snow is my snowflake hexagon wall hanging and I entered it into the Art Quilts category of the quilt festival. This project started by playing with hexagons in EQ7. I wanted to see if I could create a nice snowflake shape and then I wanted to make this into a travel friendly project because I was going on a trip to California and wanted to bring some sewing along. I designed a table runner with several snowflakes and saw this neat tutorial on Angie's Bits 'n Pieces for making reversible hexagons. Basically you make each hexagon into an individual mini quilt so I'd need something like 600+ hexagons cut out of my fabric and batting. I decided that was a bit too much to take on the trip and redesigned the project into a smaller wall hanging. In the end it took 200+ hexagons, plenty of time at a sewing machine, and lots of hand sewing. I carried this project on my trip, got the individual hexagon quilts sewn and turned. When I got home, I started sewing the opening from turning closed by hand and then sewing the individual hexagon quilts together. As the wall hanging grew, I had a lot of fun learning the best ways to connect the hexagons. 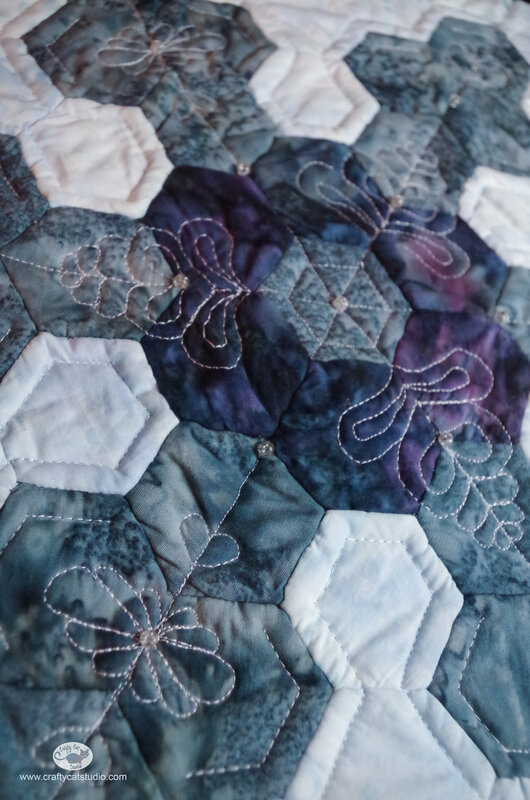 Once I had the whole quilt assembled, I took it to my sewing machine and quilted the intricate feathers across it. I felt like it needed a little bit of sparkle and raided my bead stash for some beads that looked like frozen water droplets. After hand sewing those on with some metallic thread I was happy to say it was done. I learned a lot with this project and had a lot of fun creating it. I still plan on making the table runner someday but I think I'll machine piece the top and do the batting and backing the more normal way. I found there was a lot of distortion in my hexagons since they had to go through so many steps. Thankfully with the hand sewing I was able to fix certain things as I went along and it was nice to have some hand sewing ready to go at a moments notice. Thank you for stopping by! If you like First Snow, please vote for it! Voting is open from May 24-29, 2014 and definitely take the time to check out all the other wonderful entries in this quilt festival over at Amy Creative Side! I'd love to hear about your favorites in the comments!